_ The Gourd has been used by man as far back as we can tell, since the very beginning. Gourds are believed to be the earliest plant domesticated by man. Genetic testing has shown that decorated gourds originated in Asia, but were eventually grown throughout Africa, Polynesia and the Americas. A gourd grew over Jonah to shade him from the heat as God used this vegetable to teach Jonah a lesson about forgiveness. It is speculated that they made their way to America carried across the Bering Strait and by floating on ocean currents. In the beginning gourd vines were used for shading on patios during the hot summers and, the vegetables themselves, were made into water containers to carry water from the rivers or lakes to people’s homes. They were made into bowls, cups, plates, spoons, ladles and canteens for the people to eat and drink from they also worked great for storing things. _ The American Indians used them to create all kinds of musical interments for their ritualistic music. They also created water wings, now call life vests, that the kids used until they learned how to swim and the hunters would use them with their nets to catch fish; today, we use ceramic and plastics utensils and metal silverware. 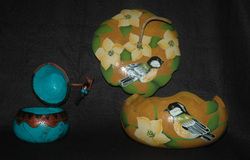 Modern day artists turn decorated gourds into functional art such as, containers, masks, jewelry, figures, musical instruments and sculptural items. Due to the versatility, just about any art medium can be applied. As gourds are a type of wood, they can be carved, wood burned and sculpted. The fibers can be used in paper making. The gourd form can become structure for basketry and sculpture. Experimentation and new forms of expression continue to be explored. In today’s world, Gourd Art is becoming very sot after and some pieces can sell for thousands of dollars in the art world. On the Hinged and Lidded Boxes page we have gourds of all different shapes, sizes, colors, and designs for you to choose from. All hand painted decorative art pieces and also functional art pieces our clients enjoy using them for jewelry boxes, or just to store things in to lower the clutter in your home. 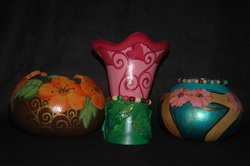 On the Bowls, Vases and Egg Style Gourd page we have Bowls to store many different things in. We have Vases to put real flowers or even grow plants in or the Egg style gourds to put silk flowers or silk plants in, but the difference is, your using a piece of functional art to do this with. On the Gourd Jewelry page, what you will find is, pendants made from the left over pieces from the gourds on the website. 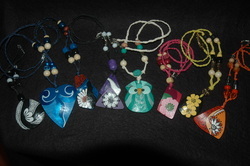 The pendants are cut and shaped into different designs then hand painted to create a one-of-a-kind jewelry piece.